These 8x8 inch soft leather-like microfiber chamois cloths are ideal for cleaning glossy, hard, and smooth surfaces -- especially plastic. Photodon's high-quality chamois cloths will gently buff away smudges, fingerprints or streaks from most surfaces. 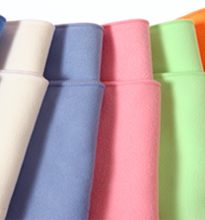 Microfiber chamois offers significant cost savings over pure leather chamois. Synthetic chamois are also extremely easy to wash and will allow for many uses if treated properly. The edges are straight cut, and can very affordably be engraved for promotional use as well. Photodon's chamois microfiber cloths are wonderful for cleaning appliances, interior and exterior auto surfaces, gaming devices, sunglasses, CD's, and jewelry. Chamois are our lintiest cloth, so they are not recommended for critical cleaning such as film installation prep or glass polishing. Materials: 80% polyester, 20% nylon (poliamide). Available in 10 or 100 packs. 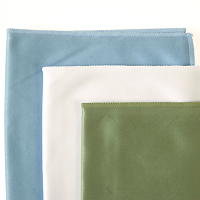 Colors: Tan, light-blue, and light-grey. Cloth Size 8" x 8"
Shipping Weight each 10 pack (both sizes): 4.8 oz. 100 pack (8" x 8"): 2.4 lbs. Options Available for promotional use: embossing only. Notes Great for car interiors, office and general cleaning. Not recommended for critical cleaning of screens.